My good friend, and maybe yours too, Maria Todd, sent me an article this afternoon from wcinsights.com. The article, “State of the State’s Well-Beings”, by Kelia Scott, discussed a recently released survey from Gallop-Healthways called the 2014 State Well-Being Rankings. 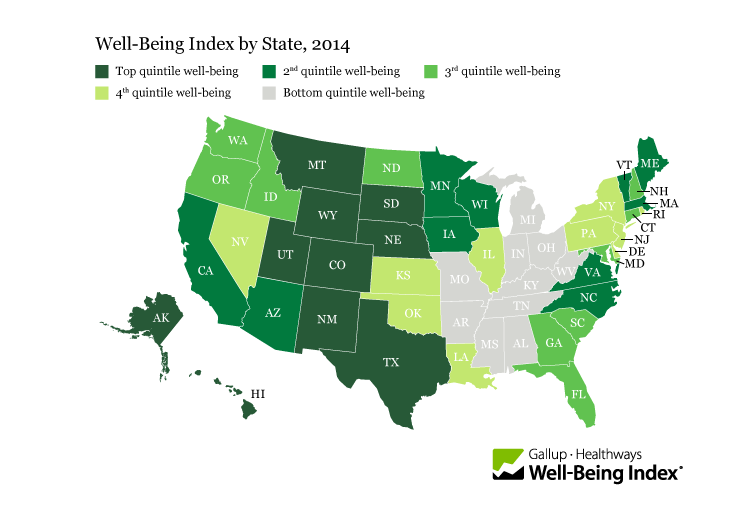 These rankings determine how each state is ranked in terms of well-being. Gallop-Healthways conducted over 176,000 interviews with adults in all fifty states, and asked them to rank elements that are related to well-being like social (having support and relationships), physical (good health and daily energy), environmental (liking your community and feeling safe), financial (managing your finances to reduce stress and insecurity) and purpose (liking what you do and feeling motivated). The findings, which can be seen in greater detail here and here as well, indicated that high rates of well-being correspond to rates of healthcare utilization, workplace performance and absenteeism, a change in obesity rates and others. In short, healthier workers may be happier workers. The map below indicates which states are in the top quintile, the 2nd quintile, the 3rd quintile, the 4th quintile and the bottom quintile. So the strategy I would recommend for anyone wishing to implement medical tourism into workers’ comp would be to consider directing your energies and resources to the following states: Michigan, Indiana, Ohio, West Virginia, Kentucky, Tennessee, Alabama, Mississippi, Arkansas, and Missouri. This would be followed by those states in the 4th and 3rd quintiles. A personal note: I know that all of you in the medical tourism industry are sending good wishes for a speedy recovery to Maria as she recuperates from her recent illness, as I am, and that she will be back to good health as soon as possible. This entry was posted in Absenteeism, Employees, Employers, Health Care, Medical Tourism, Medical Travel, Wellness, Workers' Comp, Workers' Compensation and tagged Employers, Gallop-Healthways, Health Care, Medical Tourism, Medical Travel, Well-Being, Workers' Comp, Workers' Compensation on March 10, 2015 by Transforming Workers' Comp. In an article today in Business Insurance, Stephanie Goldberg wrote that absenteeism among obese workers in the US cost employers about $8.65 billion dollars each year. This was according to a study published in the Journal of Occupational and Environmental Medicine. The costs associated with obesity-related work absences vary from state to state, Goldberg writes, citing a statement by the American College of Occupational and Environmental Medicine. The statement said, in the article, that obesity accounts for about 9.3% of all absenteeism costs nationwide, ranging from 6.5% in Washington, D.C. (hey, what about all those fat cats? ), to 12.6% in Arkansas (that’s after Bill Clinton left the state). The study, it was reported, found that obese workers miss an extra 1.1 to 1.7 days of work each year compared with overweight or normal-weight workers. “Obesity is associated with high direct costs for medical care, but the societal costs due to health-related work absences and reduced productivity could be even higher,” according to the statement referred to by Ms. Goldberg. On a side note, my brother David is one of two physicians Board Certified in Bariatrics in the State of Delaware, and many of his patients are lower-middle class and working class, blue collar workers in the Wilmington, Delaware area, so he is well aware of the problem obesity presents to the employers in his area. To get a picture of where the workers’ compensation industry is on this subject, a quick perusal of the articles written in the past year or so, informs us that this is an issue worth paying attention to. Back in April, I wrote an article about a Federal district court ruling that obesity may be a disability. The case before the court dealt with an employee who was terminated due to his obesity. One of the options the employer could have chosen instead of termination was a corporate wellness program, as in the case I cited in my White Paper. Another option is weight-loss surgery at a medical tourism destination, as one company in NC did with one of its employees, which I discussed in my article, US Companies Look to ‘Medical Tourism’ To Cut Costs, and reported on ABC News. Last May, I met the patient assistant featured in the ABC video at a medical tourism summit in Miami Beach. She recently reunited with the patient while on a business trip to the US, and from the pictures I saw, the woman who had weight-loss surgery in Costa Rica was a different person from the one on the video. So, the problem of obesity in the US is getting more costly every year, and if employers, their insurance carriers, and the employees themselves want to take an aggressive and cost-effective solution to deal with this epidemic, medical tourism would be one of the options available, so that employers would not lose productivity and absenteeism from obesity would not cost billions of dollars. And given the rising numbers of enrollees in the ACA, access to weight-loss surgery centers here in the US, may necessitate looking elsewhere, especially if costs for the procedures continue to rise, or if less expensive alternative destinations in Latin America and the Caribbean cater to such patients. Workers’ Comp would best be served by availing itself of this option. This entry was posted in Absenteeism, Medical Tourism, Obesity, Workers' Comp, Workers' Compensation and tagged Absenteeism, Caribbean, Costa Rica, Medical Tourism, Obesity, Weight-loss, Workers' Comp, Workers' Compensation on November 18, 2014 by Transforming Workers' Comp.